ANACORTES — Before a golden retriever named Murray came into her life, Deborah Morgan routinely missed phone calls, her kettle boiled over and unusual noises sounded ominous. Morgan, 48, has had limited hearing all her life. Although she can hear people speak over the phone and in person, the high-pitched whine of a kettle, the ding of a microwave or ring of the doorbell is beyond her hearing range. That can make unusual noises, especially those coming from outside her home in Sumas, sound disturbing, even threatening. “I didn’t like being alone,” Morgan said. But that hasn’t been a problem for the past six months. That’s because Murray, a lanky 21⁄2-year-old graduate of Summit Assistance Dogs, trained to work with people who have hearing impairments and joined Morgan’s family. Previously, Morgan relied on her husband, David Morgan, and their son Sterling to hear what she couldn’t. Now, thanks to months of work by Jan Hemme, a Summit volunteer, Murray uses his nose to poke Deborah Morgan in the leg and then he looks at or walks to what he needs her to pay attention to. For instance, when she drops something he pokes her leg and walks to the item. He wakes her when the alarm clock sounds, and he alerts her when he hears oncoming cars. Morgan and Murray and Hemme were recognized Sunday afternoon with seven other dogs, their new people and trainers at Summit’s graduation ceremony. The Anacortes-based nonprofit has been training assistance dogs who help with mobility, hearing or therapy for eight years. People like Morgan who receive assistance dogs are carefully matched with their dog and they undergo extensive training to learn how to work with their dogs. The training can be mentally and physically exhausting, said Garrett Lathrop, a high school freshman living in Ferndale who is partnered with Bergy, a black Labrador retriever-mix trained as a mobility assistance dog. Bergy picks up items, turn on lights and other tasks for Lathrop who uses a wheelchair. Training dogs such as Murray costs between $10,000 and $20,000 per dog. The public can stop by on Thursday mornings to observe training classes at the nonprofit’s facility at 12549 Christianson Road. Summit’s goal is to graduate 20 dogs and partners each year, but without a facility where they can keep kennels, each trainer can only work with one or two dogs, said Alice Collingwood, Summit associate director. Deborah Morgan (from left) with her hearing dog Murray and Jan Hemme, who trained him, after a ceremony Sunday marking the golden retriever and Morgan’s graduation from the Summit Assistance Dogs program. Murray uses his nose to poke Morgan, of Sumas, in the leg when the phone rings, the microwave beeps, the kettle boils, her alarm clock goes off or people are arriving at her home. Murray is the first dog that Hemme, 73, of Anacortes trained for Summit. She used to raise and train German shepherds for the sport of Schutzhund, in which dogs exhibit obedience, tracking and protection, as well as conformation. During his training, Murray lived with her and they attended training sessions at Summit’s facility. They also worked at home. Hemme started out as a puppy raiser and Murray arrived at her home when he was 14 weeks old. After he turned 18 months, Hemme asked if she could do more intensive training with him. It was Hemme who noticed how alert Murray was and how he keyed into sounds, said Sue Meinzinger, Summit founder and executive director. It was decided that Murray would make a good hearing dog, because those dogs must always be “on” and listening and the retriever has more energy than most dogs, Hemme said. Other dogs take breaks while their owners sleep, but hearing dogs must be keyed into sounds like alarm clocks or fire alarms. Because of his energy, they knew he had to have a strong partner, she said. Among their applicants, they found Deborah Morgan who has experience training dogs, including raising an Irish wolfhound that became a champion Canadian show dog. She works as a dog groomer at a kennel. Murray has only one flaw, which he demonstrated by lapping his tongue over the hand of a person greeting him. This gave David Morgan the opportunity to make a pun. “He can’t hold his L-I-C-K-E-R,” he said. Hearing Dogs, identified by an orange collar and leash and/or vest, assist deaf and hard of hearing individuals by alerting them to sounds such as a door knock or doorbell, alarm clock, oven buzzer, telephone, baby cry, name call or smoke alarm. They are trained to make physical contact and lead their deaf partners to the source of the sound. When Golden Randi hears the alarm clock ring, she jumps up onto the bed and goes to work. Bill Kerr has to get up. With 65 pounds of persistent retriever pawing gently at his chest, he doesnt have a choice. Randi is a certified Hearing Dog who assists Bill, who is severely deaf, and Rhonda, who wears aids due to a moderate hearing loss. Trained by Paws with a Cause®, Home of Ears for the Deaf, Randi has given Bill & Rhonda the freedom that they never would have been able to enjoy because of their hearing problems. Randi will respond to 7 alert sounds: the telephone, an alarm clock, door bell or knocker, the smoke alarm, a babys cry, and the subtle sounds of a twisting doorknob or window raising or breaking, the threatening sounds of an intruder. At any of these noises, Randi turns deadly serious. She will run to Bill or Rhonda and stand and stare demandingly until she makes eye contact. Then, she will take them to the source of the sound. Before Randis training, the Kerrs were dependent on remote-controlled equipment that was hooked up or carried from room to room. Randi was a family pet before earning her official degree as a Hearing Dog in 1989. But, she had to be temperament tested before she was accepted into the training program. 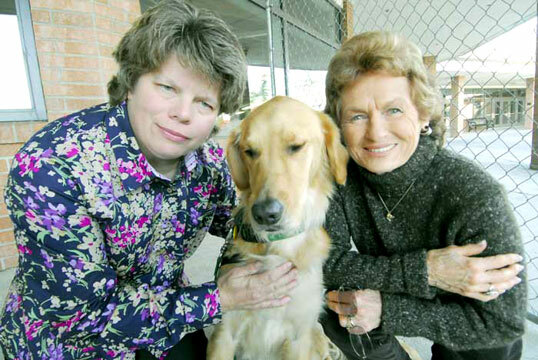 Then she attended hearing dog school at Paws headquarters and training center in Grand Rapids. She was there for four weeks of sound training. Because she had already successfully completed an obedience class, her course did not include the basic four to six weeks of obedience training that is included in the standard program. Randi completed her last six weeks of training with a Paws® field trainer who came to the Kerrs home twice a week to train the dog for the specific sounds and situations within their house. Once Randi was certified, she was issued an official ID card, an orange collar, and a short orange leash with Hearing Dog on it. Like Leader Dogs, Ra ndi has legal access everywhere. This includes public buildings & transportation, restaurants, hotels, and shops that normally exclude dogs. 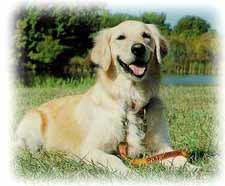 This is Florida Dog Guide Teddy, a wonderful Golden who is lovingly remembered by Darren & Rebecca Osgood. Teddy faithfully served Rebecca, as a signal dog for over five years before dying of unknown causes at about six years of age. At about a year of age, Teddy was rescued in 1991 from a dog pound in Vero Beach by Florida Dog Guides For The Deaf He came to Darren & Rebecca's home, quickly becoming a member of the family. Golden Teddy passed his testing for Guide Dog status on his first attempt and quickly took on other duties, as well. He enjoyed getting the paper and also playing Frisbee. Teddy even proved to be an excellent watch dog and was highly alert when he was alone with Rebecca. Teddy especially loved children and attention, and would purr his approval when he was happy. Although Teddy had to take medication twice a day for seizures, he did so willingly as he had always done. Teddy has been missed by one and all that had the pleasure of meeting him, but especially so by his family. 1. A minimum of 3 months/60 hrs of training must take place under supervision of a program's trainer. During this time, at least 20 hrs. of regularly scheduled training must be devoted to city work, obedience, and socialization training during the dogs entire training time. 2. Basic obedience skills the dog must master with voice and/or hand signals are: sit, stay come, down, heel and off leash recall. 3. The dog must show social behavior skills of no aggression, no inappropriate barking, no biting, no snapping/growling, no inappropriate jumping on strangers, no begging and no sniffing of people. 4. Sound awareness skills-Upon hearing a sound, the dog must make physical contact with the recipient and then specifically indicate or lead the person to the source of the sound. All dogs must be trained to at least three (3) sounds. 5. The placement of the Hearing Dog must last at least four (4) days/32 hours. By the end of the placement, the recipient will be able to correctly praise and discipline the dog, care for the dog, practice sound work with the dog, control the dog and enforce obedience skills. During the placement, the trainer will go with the recipient and the dog to do city training and go to stores and a restaurant. Also, during the placement, the trainer, recipient and dog will practice sound work and obedience every day. 6. The training facility must require recipient to complete a follow-up progress report once monthly for first 6 months following placement. Personal contact is to be done by qualified staff or program volunteer within 12-18 months of graduation and annually thereafter. 7. Identification of the Hearing Dog and recipient will be accomplished with a laminated ID card with a photo of the dog and partner and names of both recipient and dog. The dog must wear a blaze orange collar and leash, approved by Assistance Dogs International, with Hearing Dog printed/stitched on it and a cape with the program's logo whenever in public. 8. The staff of the training center must demonstrate knowledge of deafness, deaf culture and hearing impairment. A staff member or agent must know basic sign language. Organization shall make available educational material on different disabilities. 9. The recipient must agree to abide the Minimum Standards for Assistance Dog Partners. 10. At the onset of training, every dog will be spayed or neutered and will have a thorough medical evaluation to determine that the dog does not have any physical problems that would cause difficulty for a working dog. This is simply a fabulous video. We don't have hearing difficulties but can see how teaching this behavior could be a life-saving one. The way the task is broken down is excellent, and just wonderful for those folks who are training their own hearing dog. The video helps folks to train a service dog to alert you to sounds (hearing alerts) and do diabetic and other medical alerts. Note the star (*) indicates when the clicker marks the behavior. Barking is not a behavior that is desirable for an alert behavior for assistance dogs. In public is is disruptive and is only used for emergencies to call attention to a person that needs help. That is why a silent alert is much more effective. This Closed Captioned video comes from Donna Hill, Vancouver Island Assistance Dogs, Nanaimo, British Columbia. They are a group of volunteers who are helping people on Vancouver Island to overcome or mitigate the difficulties of living with disabling conditions (no matter the degree of severity) by assisting them to train their own mobility assistance dog, hearing dog and/or other service dog at no cost to them. Besides doing in-home training for individuals in the Nanaimo area, they offer email, their great blog, and also video support for those in other regions. Click here to learn the alphabet. Click here to enter a word and have it returned in ASL finger spelling. Click here to take a finger spelling quiz when you're ready. Now, can you figure out what the above hand is spelling? Learn lots more about this wonderful profession with the following web, print and video resources.